New and renewing members are required to register online by completing the online form, and making payment either online via PayPal, Direct Deposit or at the Club with cash (we do not have eftpos / credit card facilities). Once we have received your registration, you can turn up the following Sunday between 8:30am and 9:00am so we can sight your vaccination certificate / concession cards to complete membership process. The first day for new members is an introductory session to familiarise you and your dog with the Hastings Dog Club. After your first day, members will be placed in an appropriate level Obedience class. Classes are $2 per week, regardless of how many classes you participate in. All members must wear name tags, which for new members will be provided on your first day. Last day of classes for 2018 will be on Sunday 25th November (Members Fun Day on Sunday 2nd December). Classes will resume on Sunday 3rd February 2019. Seasons Greetings & Happy New Year! SINGLE memberships cover ONE person. FAMILY memberships cover 2 adults and 2 children under 16 from the same family. Please enter the name and contact details of the person who will be bringing your dog to our club. This is the "Handler" and main member. We will make name badges with this person's name on it so please make sure this is accurate. Family memberships allow for up to four members from the same family. Please add extra handler's names below. For RENEWALS please select the class you are currently enrolled in. For NEW MEMBERS, please select Beginners Class based on the age of your dog. Please provide the date your dog is DUE for its next Vaccination (not the date given). Please bring proof of vaccination to Club with you (or upload proof below). To save time at Club, you might like to upload picture of your Vaccination Certificate or Record. 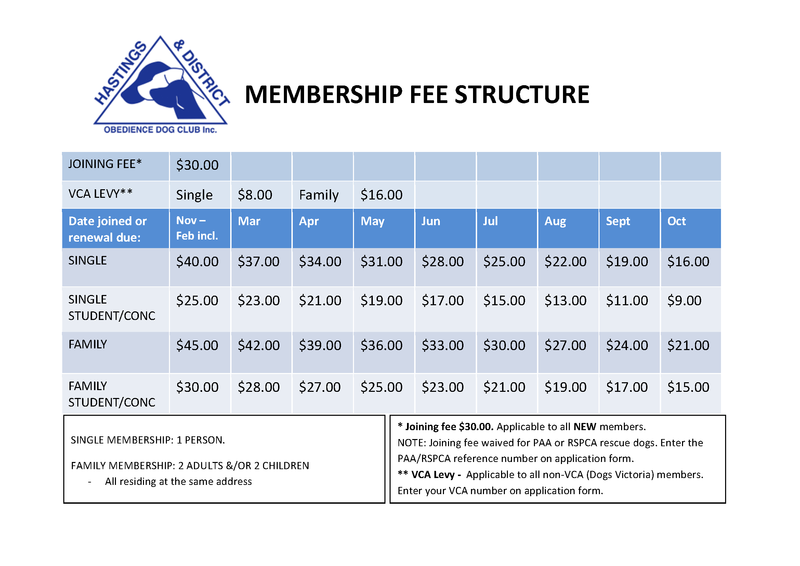 If you are an existing VCA (Victorian Canine Association) member, or your dog is from Peninsula Animal Aid or RSPCA, or you hold a concession card, you may be entitled to a discounted membership. I agree to abide by the Constitution, Rules and Regulations of The Hastings & District Obedience Dog Club Inc. The club will not be liable for personal injury, property loss or damage on the training ground. I understand that before attending classes I will be required to provide proof of current Vaccination Certificate(s). Pay CASH at the Club. If you have selected 'OTHER' above please bring proof of payment to Club. If you prefer, you can upload proof of payment here.